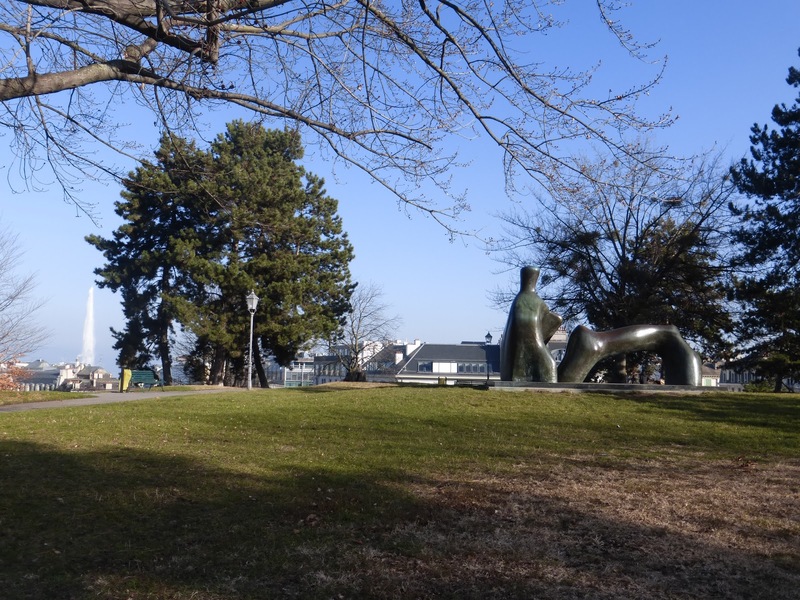 The museum or gallery outside Britain that I know best is the Museum of Art and History in Geneva; my wife grew up in the city, and we make regular trips there. MAH, as it's generally known, can't claim to have a world-class collection of paintings; few of the 'big names' are present. On the other hand, it does possess what I assume to be the finest collections of pictures by two Swiss artists who I'm ashamed to say I'd never heard of before first visiting the museum, Jean-Etienne Liotard (1702-89), and Ferdinand Hodler (1853-1918), both of whom I'm very glad to have learnt about. The star attraction of the MAH's art collection is Konrad Witz's altarpiece of 1444, which includes this panel, 'The Miraculous Draft of Fishes'; its fame is due to its being the first painting to include a real, recognisable, closely observed landscape; earlier paintings had of course included landscapes, but they're generic rather than specific. Witz's painting shows the shores of Lake Geneva, very appropriately as the altarpiece was made for Geneva cathedral, and the familiar locale would have brought the story from the Gospels close to home. 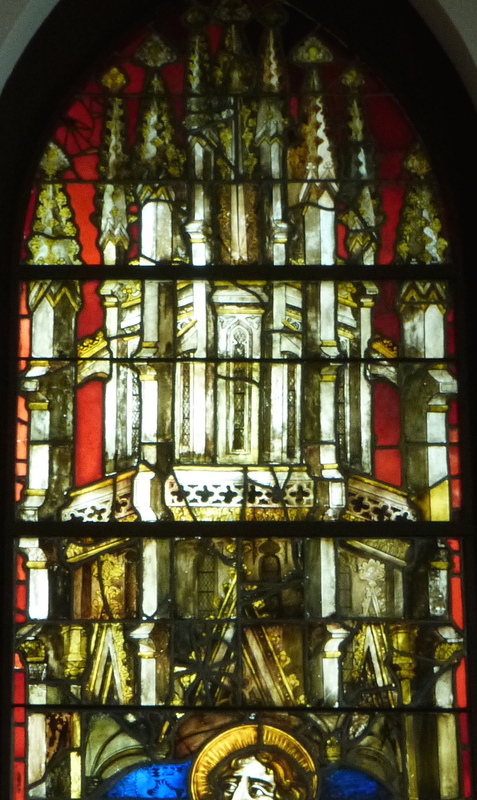 Other artefacts originally from the cathedral and now in the museum are stained glass windows made for the apse in the later 15th century, but moved in 1888 and replaced by copies. They're not especially easy to photograph adequately, being inconsistently lit and having a display case in the middle of the room obstructing the view. However, I can't find a complete set of photos anywhere on the internet, so my attempts will have to do for now. The figures are all richly apparelled, most of the men bearded, but it's the canopies that especially catch the eye. They're marvellous, rocketing above the saints and thoroughly outdoing them in visual flair. It's instructive to compare them with earlier canopies, for example these, made a century and a half or so before the Genevan examples. 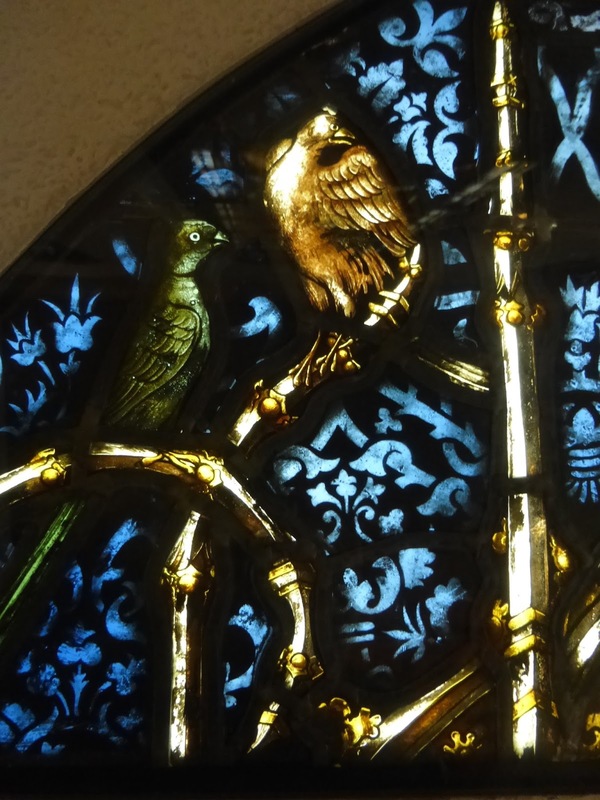 Canopies were a feature of stained glass from at least the 12th century, and to begin with were simple in design and two dimensional. During the 14th century in particular they displayed a delight in surface patterns. Later, in the 15th century, they became ever more elaborately three dimensional, and sometimes dominated the figures or scenes they sheltered. 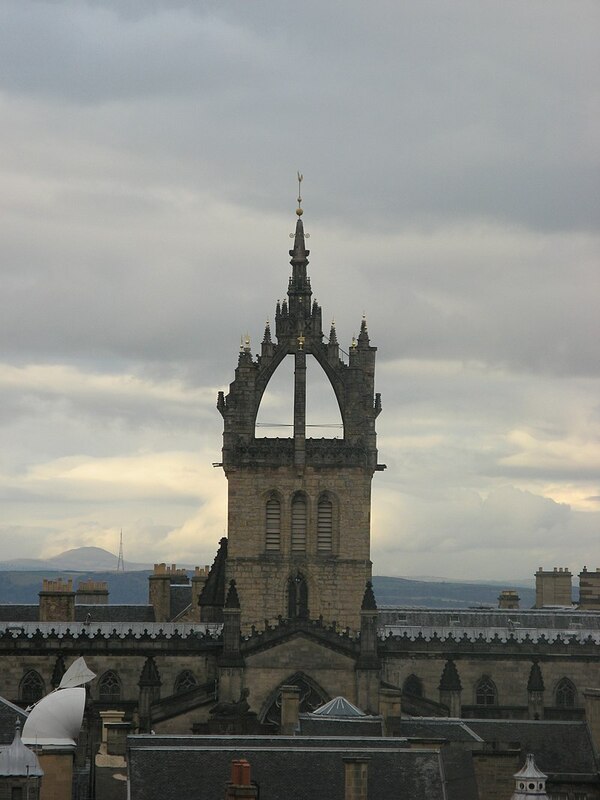 The canopy appears to be square in plan, and the ribs hold up a small tabernacle-like structure, a miniature version of a crown steeple as seen, for example, on Edinburgh cathedral. Structures like this were built in England and Scotland in the later 15th century; Edinburgh's example dates from 1495. Were there Swiss or French versions that the stained glass designer could have been thinking of? 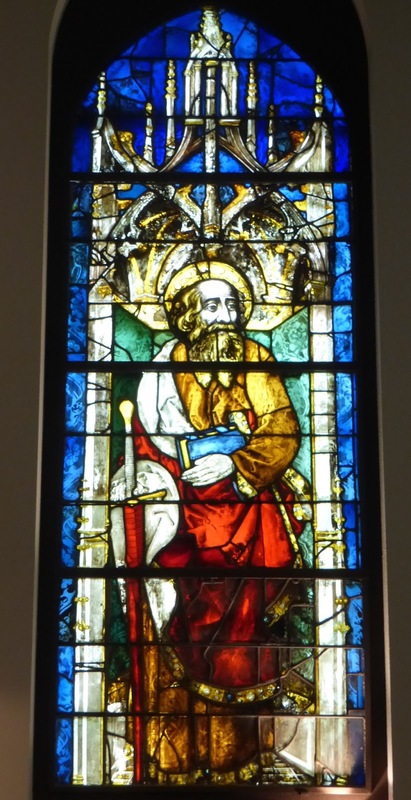 St Andrew, with the same date and attribution. He has an open book in his left hand, and an X-shaped cross, the instrument of his martyrdom, in his right. His canopy is hexagonal and more elaborate than St Paul's, with abundant foliage-like 'carving'. 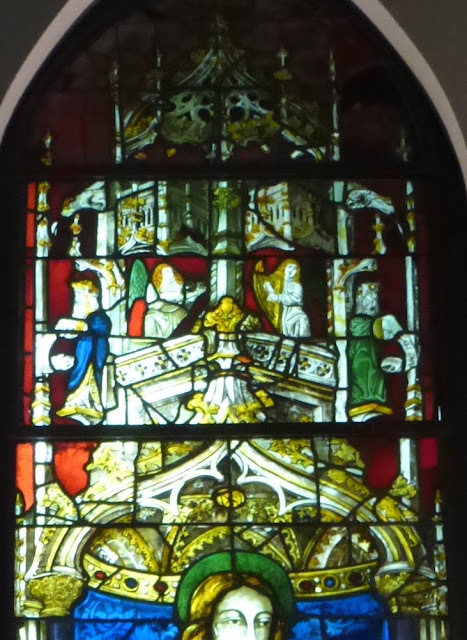 It features shields with crossed keys (I think the emblem of the cathedral chapter), and two angels precariously balance on ledges, playing a lute and a psaltery. Three stained glass windows are seen in the background. St Peter, again with the same date and attribution, though heavily restored. He carries a book and the keys to the kingdom of Heaven. The tiled floor on which he stands shows no sign of an awareness of perspective, though Italian artists would have been familiar with the concept for a couple of decades. His canopy is again hexagonal, and looks more like a structure that could actually have been built than those of Paul or Andrew. St James the Greater, 1487, attributed to Etienne Fabri, known as Marlioz (another artist unknown to the internet). 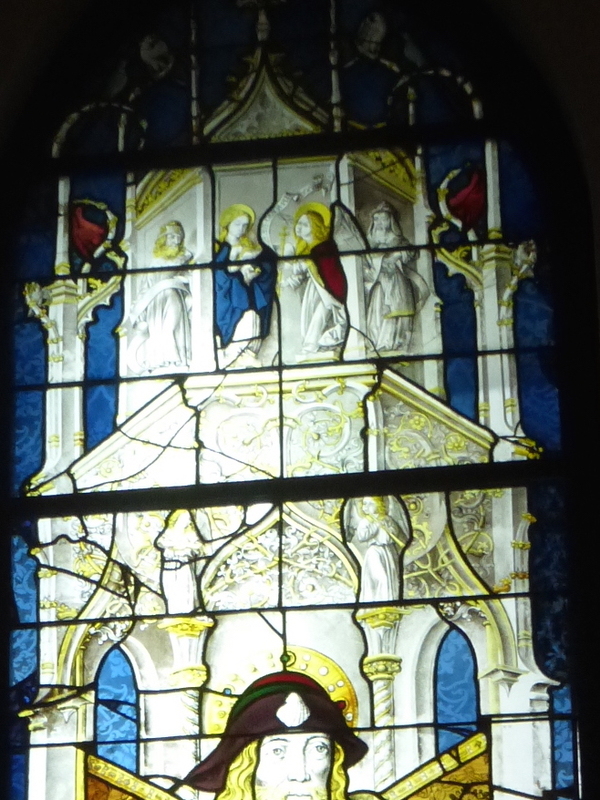 This is the most intact and least restored of the six windows. He carries his pilgrim's staff in his left hand and, on his pilgrim's hat, a scallop shell. In his right he holds a small open book with a decorative (possibly adorned with precious stones) cover. His robe is trimmed with ermine, a fur associated with royalty and important officials. 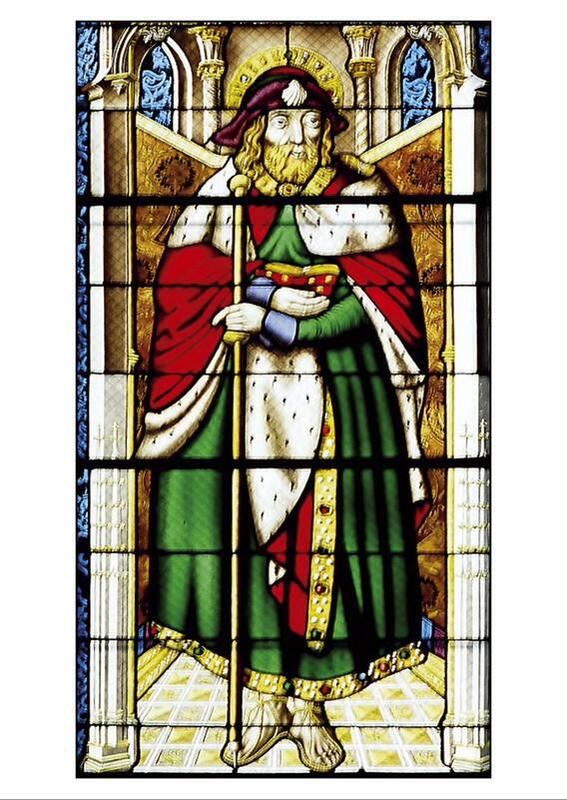 All the figures in the windows are given a worldly splendour to echo their spiritual significance, but I don't know why James is particularly ostentatious. 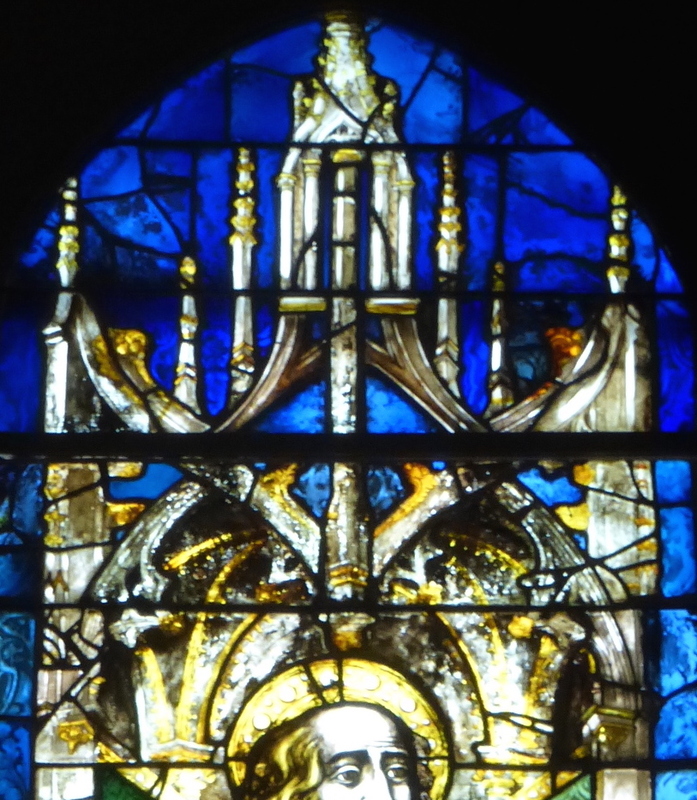 His hexagonal canopy has ogee arches and much filigree tracery and ribbing. Just above his head are two musician angels, playing respectively a lute and a shawm. At the top, like tourists who've climbed a tower for the view, two prophets flank an Annunciation scene, with Mary on the left and Gabriel on the right. Perched on the flying ribs above them are eight birds, though they're hard to see in the museum or in the photo because the artificial light in the display case is inadequate. At James's feet two handsome angels display the arms of the Malvenda family, who donated the window to the church. The display case in the middle of the room makes it impossible to photograph St John the Evangelist directly from the front (at least, not without sneaking a stepladder into the museum). This window is also attributed to Marlioz, but dates from c.1500, a little later than that of St James. St John raises his right hand in benediction, and in his left displays a chalice on which is balanced a serpent or dragon, a reference to the Book of Revelation (which was traditionally attributed to him). His head and some other details are restorations. Unlike the other figures, who look out confidently from their windows, he avoids our gaze. Unlike the other men in the windows, he's clean-shaven. My poor quality photo (sorry; I'll try to do better next time) makes the details of the canopy hard to read. 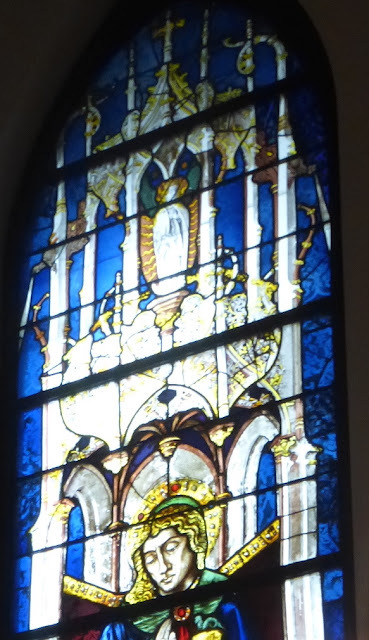 Above the saint is an image of the Virgin Mary in glory emitting rays of light. She stands on a crescent moon. On the level of her head, at either side of the window, are two gargoyles in the form of (according to the museum signage) dogs spitting water. This could be another reference to Revelation; however, while dogs do feature in passing in the book, it's dragons that are described as spitting water, not dogs. Probably they are there to give architectural realism to the canopy; gargoyles do of course spout water. 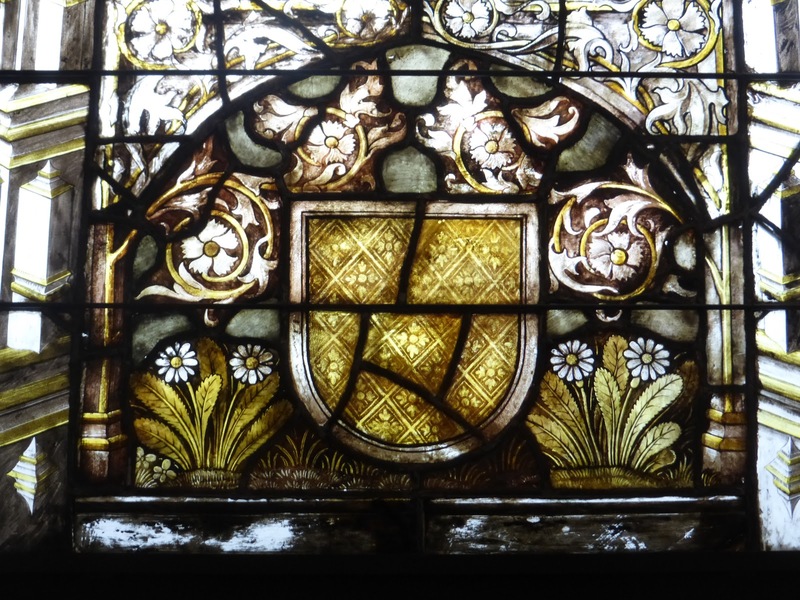 At the bottom of the window are the arms of the donor family, the Faesch-Michelis, along with some appealing daisies. St Mary Magdalen, c.1490, again attributed to Marlioz; her head is a restoration She holds the jar containing the spices with which she anointed Christ's body after the Crucifixion. Her canopy, unlike all the others, is round. In it are two angels playing a lute and a harp respectively, and two prophets. Above the prophets are two more gargoyles spouting rainwater. 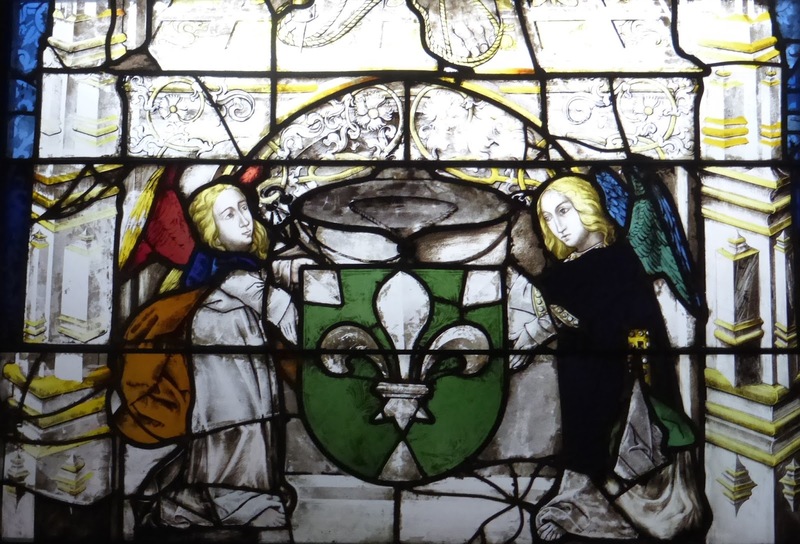 I think the small central boss of the vaulting features the arms of the donor, Canon Francois de Charonsannay; if this is true, he was a model of self-effacement compared to the other donors, who expected their munificence to be loudly, unmistakably broadcast. 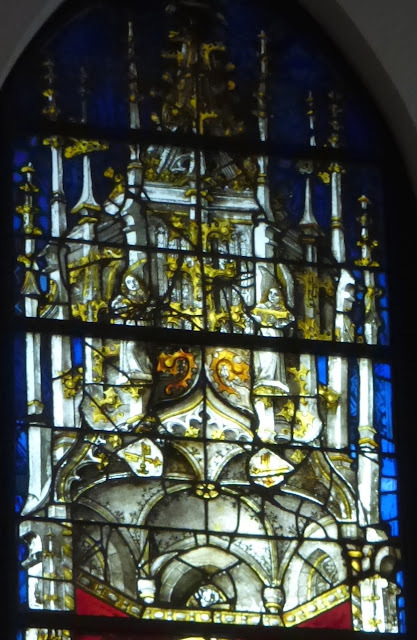 This fragment, once more attributed to Marlioz and dating from c.1500, comes from the top of a window, probably one depicting St Michael given to the cathedral by the canon Dominique de Viry. Birds perch on the vine-like ribs of the canopy. Those on the far left and right look quite genial, while the other two are more heraldically assertive. I'm struck by one feature of all the windows (except the fragment), which is that the leading is far more geometric than that of earlier stained glass. Most of the horizontal cames continue uninterrupted from one side to the other, and some of the ones in between are vertical, creating a brick- or tile-like pattern. 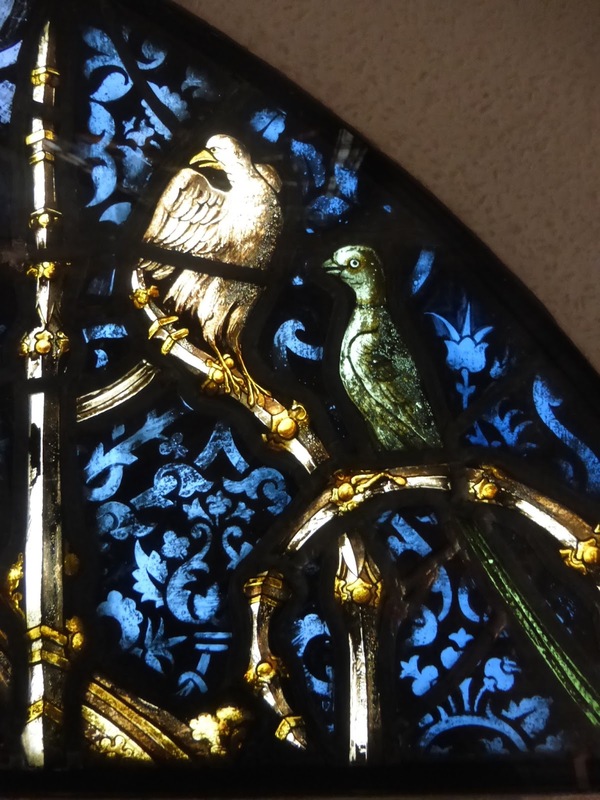 Earlier stained glass had cames that followed the outlines of the design much more closely and organically; you could say that this later rigidity is the beginning of the end for a tradition of medieval stained glass that dated back at least five hundred years. When the Reformation arrived shortly after the last of these windows was made, stained glass as it had been practiced almost died out, to be replaced by a new tradition of painting in coloured enamels on (usually) regularly shaped pieces of glass. MAH's windows are just about the end of the line. December in Geneva, from the MAH; on the right, a sculpture by Henry Moore, and, on the left, the imaginatively named Jet d'Eau. The 19th century copy of St James now in the cathedral.